I n between yes and no is a space where life and its unfoldings simply exist. We can argue with what is at this moment, shower a curse of opinions or pray a blessing of hopes. None of this changes the way the world, right now, at this moment, unfolds. To be able to sit in the midst of our opinions, biases and well-worn stories — and without struggle or striving, recognize and allow this moment to simply be as it is – is a gift we give ourselves. For a breath or two or ten, we drop our scheming, list- making, planning and A/B contingency flowcharting. For a moment, we allow the imbedded actuarial tables calibrated in childhood to suspend and go transparent. We spend so much time planning for the future by rehashing missteps of the past that we rarely find sure footing in this one-and-only present moment. We drink the wine of insecurity, imagining that we can find a handle on this ever-changing world that will give us the leverage we crave to wedge a block into the gears of time and freeze the world into something manageable and known. That’s about as helpful as holding onto our exhale in fear of what our inhalation might bring. Who among us has not sought out the feeling of safety that comes with a sense of security? How many of us choose the anxiety-producing unknown over the habituated path our feet comfortably have trod? That space between yes and no, the one free of our preconceptions and fears, the one empty of expectations, does not, as we so often fear, leave us empty and grey. But when emptied of expectation, freed from the grasp of our hopes and without the constant whisper of “this is how it is,” a sense of gentle possibility arises that the world actually unfolds quite well without our vigilant attention. Those stories that pass down through generations — we think we own them, but the truth is they own us. Take any hatred, or even a minor irritation for that matter, and watch the “shoulds” and “oughts” appear. How often is it our own experience that brings these forth? And how often does it come from the way our father frowned or our mother lowered her voice, or from endless repetitions of newspaper headlines, of TV news imploring our attention until we finally decide the world IS the way we again and again have been told. Consider the freedom to float weightlessly between yes and no and simply accept what is unfolding without disagreement or denial, but just as it is in this moment. Be it a diagnosis, disagreement, lucky break, summons or scalpel. Threat, promise or pain. Without dissociating, without surrendering to fear and without taking our most unsavory parts and projecting them onto those we perceive as different from ourselves. Instead, making space to allow our contradictions to have a conversation instead of confrontation. Perhaps this can help us to make more informed decisions with an eye toward compassion for all involved. Generally speaking, the vast majority of acupuncture points are found along the pathway of the acupuncture meridians. But there are a number of points found “off channel.” Today’s DIY acupuncture visits the Tong Tradition* points of Middle White, Lower White and Upper White. These points are useful in the treatment of back pain, sciatica and hip pain. Basically, they are not so much “points” as they are areas of influence. 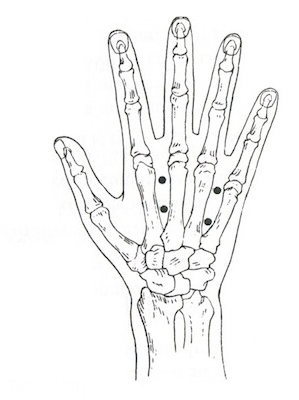 On the back of your hand, press along the area between Middle and Lower White (located in between the metacarpals of the little and ring finger) looking for areas that either feel tender to the touch, or feel “crunchy.” Then explore the area around Upper White, which is located in between the heads of the metacarpals of the middle and index finger, as well as the area up to an inch below. The areas that are reactive tend to treat pain the best. To treat yourself, simply find the sore spots and press with your thumb, the end of a chopstick, or the eraser end of a pencil. Especially for acute back pain, stimulating these sensitive areas while gently rotating your hips can bring a lot of relief quickly. For sciatic pain that is made worse by sitting, massaging these areas on the back of your hand can reduce the discomfort caused by sitting. 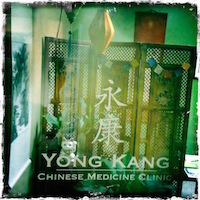 * Tong style acupuncture is a lineage Taiwanese tradition of acupuncture. It varies quite widely from the forms of acupuncture usually employed in mainland China and often taught in western schools. I first ran into this method when living in Taiwan, and it has been part of personal study ever since. There is a delightful response that the famous cellist Pablo Casals gave when asked why he continued to practice when he was already in his 90’s. on getting rid of your sweet tooth? You might think that the process of change is all about will power, and your supply of that precious commodity is not up to the task. But the process of change is not just about bare-knuckled will power; it’s about relentless persistence in the direction you want to go with your strategy in hand. Success and progress are not a straight line. We imagine it to be that way, but that’s a lie. It may seem as though you are constantly going in circles, but look again. It’s probably spirals. Just like those of the nautilus shell, the seed head of a sunflower, the unfurling of a fiddlehead fern, the corkscrew flight pattern of a hawk riding a summer thermal or the whorl of a galaxy. We come back time and again to certain themes, moments and learning, and so often think, “Oh no, this again.” But look closer. Note the progress you have made. Often when we revisit our “issues,” we don’t realize at first that we have reached a higher level of integration. We imagine straight lines, but there are no straight lines in nature. 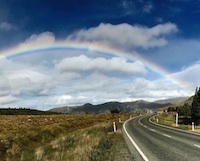 We imagine overnight success and the one-and-done intervention, but those are usually one moment toward the end of a process that has been long unfolding. Not circles — spirals. Note your progress. Give up on one-and-done. Give up on “I’ll get this one thing fixed and then everything will be smooth from this moment onward.” Another turn always comes on a spiral – that is the nature of the form. The spiral presents another opportunity to make the choice that moves us in the direction we have chosen. How is the issue in front of you in this moment different from what it was a year ago? A month ago? What progress or changes have you made that you usually discount instead of embrace? Write it down and see your progress on paper. Ready to get some traction on changing your relationship with sugar? Download the Transform Your Relationship with Sugar Resource Kit and get a taste for what this 45 day journey is all about! What if love never feels safe? What if it was never meant to provide you with consistent feelings of comfort, certainty, and security? What if it comes spinning out of the stars offering something much more radical, creative, and transformative than safety could ever deliver? Perhaps it wasn't safety you were seeking after all, but wholeness and an untamed, erupting sort of aliveness?